Are you frustrated with stubborn fat on your body and are not seeing results from dieting or exercise? CoolSculpting could finally be the solution that will relieve your frustration and leave you confident with your body. The CoolSculpting procedure is the only FDA-cleared fat reduction treatment that uses the method of controlled cooling to eliminate stubborn fat that resists the efforts to be eliminated by diet and exercise. Most importantly CoolSculpting is a non-invasive procedure with no cutting and no needles that are common in other risky fat reduction operations.The rising success of this treatment has captured the attention of the media including being featured on TV shows like The Doctors, E!News, Dr. Oz, Good Morning America and featuring in magazines such as GQ, Elle, Vogue, Shape and Men’s Health. As well, CoolSculpting has been named for three consecutive years in a row the “Best Non-invasive Fat Reducer” in the NewBeauty Annual Beauty Choice Awards. Today, 4 million CoolSculpting treatments have been performed worldwide and have helped patients feel happy with their bodies and with one consultation one of these patients could be you! 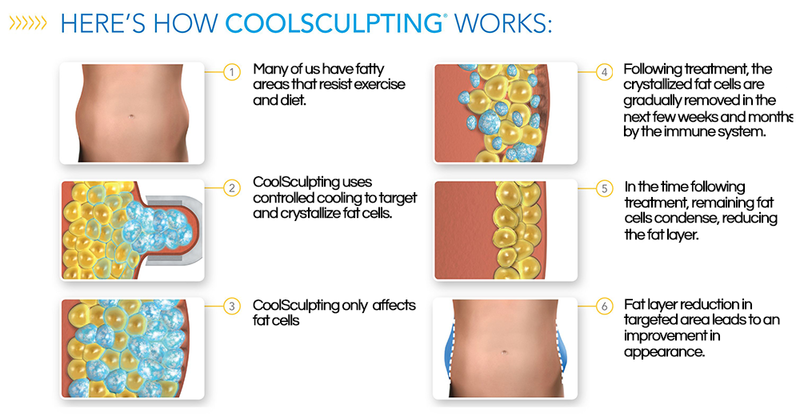 How Is CoolSculpting Able To Eliminate Fat ? Years ago a group of scientists at Harvard University discovered that cold can target fat cells without any damage of skin around the tissue just by observing the smaller cheeks of children who ate Popsicles. This discovery is based on the proprietary science of Cryolipolysis(R), a process demonstrating that when fat cells are exposed to extreme cold, they die and are eliminated naturally from the body. Fat cells are able to be frozen during the CoolSculpting Procedure then gradually die off and leave your body through a natural elimination process. This is the reason the results are long term and those fat cells are gone permanently with CoolSculpting! The Difference Between |Losing fat With Cool Sculpting VS.Losing Weight? The number of fat cells in our body starts to become a fixed number as we grow into adults. It is very hard to eliminate fat cells, and losing or gaining weight does not increase or decrease the amount of fat cells, but in fact only changes the size of the fat cells. Dieting and exercise will help you with weight loss but is only making the same amount of fat cells smaller. However, CoolSculpting fat-freezing procedure is unique and has the ability to reduce the number of fat cells by 20-25%. These fat cells are eliminated and will not move to other areas of your body. Unlike other procedures, fat cells in untreated areas will also not change due to CoolSculpting. The CoolSculpting procedure may not change you weight but you will look thinner and have a changed shape. The biggest difference between CoolSculpting and other Fat Reduction procedures is that CoolSculpting is non-invasive meaning there is no incisions or injections made to the body. Some patients even enjoy watching TV, checking emails, and can even nap during the procedure. The only feeling is an intense cold sensation that soon numbs and some light pulling of the skin as suction is applied as well. CoolSculpting involves no down time unlike many other procedures that leave you feeling tired and unable to return to your daily routine. Most patients say that they can return back to work and to daily activities the same day. Today everyone has busy schedules and can’t afford to take time off.That’s why many people trust CoolSculpting because it is able to give you better results in a better time frame that works with your lifestyle. Patients have seen positive changes in their bodies as quickly as 1-3 months where they had CoolSculpting done. The CoolSculpting Procedure is very personalized and unique to every individual and that is why a consultation is so important. A CoolSculpting Physician at The Centre for Dermatology will be able to help you create a personalized treatment plan in order to achieve you specific goals. Depending on the part of your body, for example whether it is the thigh, abdomen,chin, or upper arm the number of sessions and the time needed for each varies from one individual to the next. Everyone’s body and goals are different so it is only suitable that CoolSculpting is able to provide a personalized treatment for each patient inorder to achieve the results they want. With our recent “Cool Event” in May we introduced this procedure to more of our clinic’s community, and now CoolSculpting has become a more popular treatment requested by our patients. Many are happy with the results they are seeing through their sessions and wondering why they did not try CoolSculpting sooner. The Centre for Dermatology is a trusted dermatology and cosmetic clinic and it is important to us to stay up to date with the latest cosmetic treatments.We are happy to be a CoolSculpting Certified Practice as CoolSculpting remains to be the #1 non-invasive fat-reduction procedure helping men and women love every angle of themselves! If you’d like to know more about this procedure, please contact us at 289-809-0186 and the friendly team of The Centre for Dermatology will be happy to advise you.